Mazda RX-7 collecting enthusiastic fans who have finished production as a pure sports car with a drift spec rotary engine. 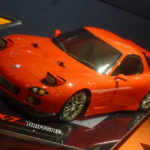 Among them, the third generation FD 3 S which was fully remodeled in October 1991 was finished as a drift specification. 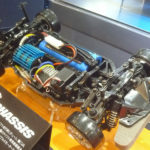 TT-02D of shaft drive 4WD for chassis. CVA oil damper · Super mini, full bearing, sports tune motor etc. are equipped as standard, you can enjoy thrilling running. ★ Length 449 mm. ★ Realistically reproduce beautiful form with curved surface with dynamic feeling with polycarbonate. ★ Chrome plated finish mesh wheels fitted with super drift tires. This entry was posted in Event Report, Future Releases on May 12, 2017 by admin.